DeltaGlass high temperature and heat resistant fiberglass sleeve is a braided fiberglass (fibreglass / glassfibre) sleeve, fabricated from high quality type E fiberglass that will not burn and will withstand continuous exposure to temperatures of 1200°F / 648°C. It provides excellent protection for industrial wires, cables, hoses (hydraulics), tube and pipes and also provides thermal insulation and personnel protection. This is a general purpose industrial grade sleeve available in a Thin Wall version (1/16" wall thickness) and also a Thick Wall version (1/8"). 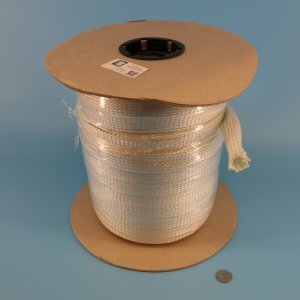 This product is available By-The-Foot or in full spool lengths. This high temperature sleeve / heat resistant sleeve resists most acids and alkalis and is unaffected by most bleaches and solvents. It is highly flexible and conformable.